The human hepatoma cell line HepG2 was used to study the effect of cetaben, a non-fibrate hypolipidemic drug, on cell morphology and vesicle distribution. Cetaben treatment correlated with a fragmentation and/or condensation of Golgi cisternae and the appearance of large electron-lucent vesicles. The Golgi apparatus, demonstrated, for example, by fluorescence-lectin histochemistry, was fragmented after cetaben treatment. The lectin-positive remnants were dispersed throughout the cytoplasm, but with a preference for being transported to tips of cells. However, microtubules and the intermediate filaments as well as the actin microfilaments were unchanged after cetaben treatment indicating that changes in Golgi morphology are not caused by alterations in the cytoskeleton. Cetaben decreases the cholesterol content due to inhibition of cholesterol biosynthesis. 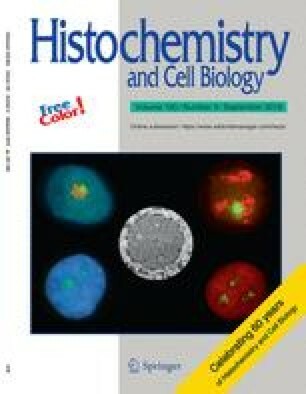 Changes in the intracellular cholesterol content are known to influence the intracellular vesicle distribution and are most likely responsible for cetaben-induced Golgi alterations, as depletion of cellular cholesterol by starvation or lovastatin and/or cyclodextrin treatment resulted in a similar redistribution of Golgi-derived wheat germ agglutinin vesicles. These lectin-stained vesicles colocalized with lysosomal marker proteins such as Limp-1 and Lamp-2, but not with the early endosomal markers Rab5 and EEA1. Upon removal of cetaben the lectin- and Limp-1/Lamp-2-costained vesicles dissociated and were transported back to the perinuclear region. Thus, cetaben-induced changes such as fragmentation of the Golgi apparatus and the dispersion of lysosomes away from their juxtanuclear location were reversible. We are grateful to W. Tschulenk, N. Kielhausen, and B. Machac for technical assistance. Antibodies to catalase, PMP70, ER HMG-CoA reductase, IPP isomerase, and squalene synthase kindly provided by Drs. A. Voelkl, P. Edwards, S. Krisans, and. I. Shechter. This project was supported in part by OENB project number 8198 and Anton Dreher Gedächtnisschenkung number 318.